Ori and the Blind Forest came out and surprised us all at the Microsoft press conference. Developed by Moon Studios, the game shows off some beautiful hand-painted environments and stunning music. Some might compare it to Child of Light, but they shouldn’t. Ori and the Blind Forest tells a story of self identity and discovery, of sacrificing yourself for others. The designers were inspired by Disney and Miyazaki films and wanted to create a platformer with puzzle elements. It has the classic health and energy bars, but energy takes on a new form in the game. Energy is used for abilities, unlocking doors, and even saving. While there are set save points, it is also possible to create a soul link with energy to save at any point. This adds some extra strategy as players must decide if they will spend their energy on saving, or keep it for future encounters. Early on in the game, Ori encounters Sein, his glowing spirit companion who enables him to fight and also provides him with a map. The world of Nibel is huge and the game testers approximate that the game is 10 hours long for non-completionists. The game starts very easily. The controls are intuitive – something that was a top priority during the four years the game spent in development. While the game is stunningly beautiful, it is also extremely clear. Often in platformers (particularly the more aesthetically interesting ones) it can becoming unclear which platforms can be used and which ones are meant to blend into the background. Ori and the Blind Forest has a fantastic aesthetic, but also ensures that such design flaws are not present, something that greatly enhances gameplay. 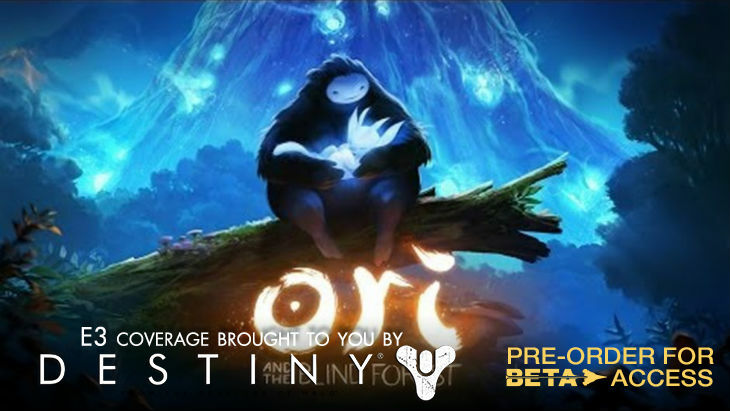 Strongly influenced by Metroidvania and Zelda, Ori and the Blind Forest is “a gamer’s game”. It actually has quite in-depth mechanics and gameplay. Even completing the demo posed quite a challenge for many of the gamers playing. The combat is fluid with enemies respawning as soon as Ori moves out of that screen; in many ways it feels like a classic ARPG but wrapped up in a Metroidvania-esque platformer. Ori and the Blind Forest releases this fall (in the Northern Hemisphere, we’ll be getting it after the thaw in South Africa) on Xbox One and PC for digital download.